Native to Europe and Asia, burdock is largely regarded as a cleansing remedy that helps to rid the body of toxins, including heavy metals, and is generally used for skin problems, arthritic conditions, and infections. The root and leaves are traditionally used in Europe, while the seeds are preferred in Chinese medicine and are often included in remedies for common colds. Often combined with dandelion or yellow dock, burdock is an effective blood purifier used to treat psoriasis, eczema, oily skin, acne, boils and gout. 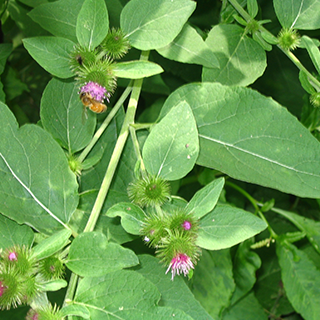 For treating cancer, burdock is often combined with red clover. Make an infusion of 1 tsp root per cup boiling water. Drink 1?2–1 cup 3 times daily for skin disorders, including persistent boils, sores, and dry eczema. Use a cup of the mix as a wash for acne and fungal skin infections including athlete’s foot or ringworm. Take 1 wineglass of a standard leaf infusion before meals as a mild digestive stimulant to combat indigestion. Take 1 standard decoction of the seeds up to 3 times daily for feverish colds and infections with sore throat and cough; it is often combined with honeysuckle flowers or forsythia berries. Take 1–2 tsp (5–10ml) root tincture 3 times daily to detoxify the system in arthritic conditions, for urinary stones and gravel, or to stimulate digestion. Usually used in combination with other herbs. Use a root poultice for skin sores and leg ulcers. The steamed roots are mashed and applied to the affected area as hot as can be tolerated. The fresh leaves may be slightly steaming until flexible and applied hot. This poultice draws out splinters, poisons and suppuration, improves blood flow to injured or infected areas, fights infection, and speeds the healing process. Fresh burdock root is eaten as a medical vegetable - boiled, steamed or used as an ingredient in stir-fry. The raw root is excellent when grated and marinated. Soup is prepared by boiling pieces of the fresh root along with other root vegetables, mushrooms and edible herbs until all ingredients are cooked. Served hot, the soup will fortify the system against diseases or, if taken by the convalescent, will help to strengthen all body systems and accelerate recovery. Prefers moist, neutral to alkaline soil in full sun to partial shade. Sow the seeds where you want to grow them in spring. Self-seeds prolifically and can be invasive. Harvest the plant before the fruits are ripe to reduce the spread. The root is generally collected in late summer and the leaves when the plant is just starting to flower; the seeds should be gathered when ripe in autumn.